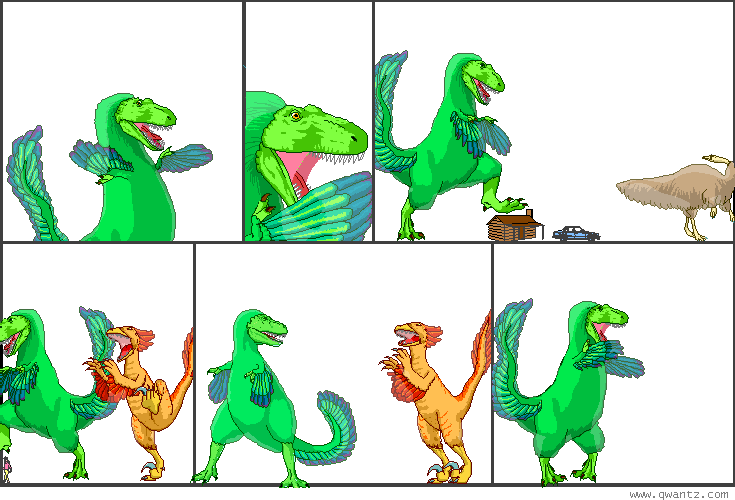 Dinosaur Comics - September 22nd, 2010 - awesome fun times! September 22nd, 2010: Here's a little sequel to the comic from last week: in case you were wondering if there were some balls still to trip, the answer is YES. If the sun disappeared not only would we not know about it for eight minutes, but we'd still keep happily orbiting that non-existant sun too! The planets would stop orbiting from the inside out one-by-one as the change in gravity reached them; that seems like a neat thing to imagine seeing. One year ago today: A.F.S. said the only reason life is APPARENTLY thriving is because nature doesn't want the death of an individual to end things forever. With enough life running around and eating other life, you can have tons more misery to go around AND avoid the danger of having the death of an individual impact the viability of life on the planet, thereby ensuring endless future misery down the road! A. Friggin' S., ladies and gentlemen!